Type : self-paced , designed for 7 weeks duration, 84 h. I don’t know if a certificate is still delivered, but you can check your grades on the “progression page” and make screenshots “to prove” your qualification. Also, you may spend more than 7 weeks to finish the course. 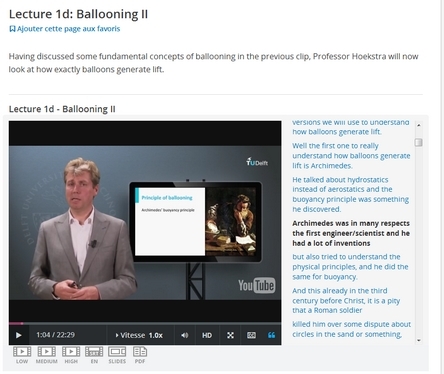 This aviation Mooc is challenging but it is also very well designed; one of my favorite aviation Moocs. 2) Montgolfier: Some say that the hot air balloons with which the Montgolfier brothers performed their first flight had a volume of 1700 cubic meters and could lift 780 kilograms (that includes the balloon, basket and payload). Assume that the balloon took off on a day when the sea level pressure was 1013.25 hPa. My personal score for the first homework quiz (14 questions) was 100%, but it took me a lot of time and research to calculate and to find out the right answers. Discussion on the forum is interesting and you may exchange indications (not solutions! ).